(Green flesh) 80 days. [Grown in Anne Arundel County, MD, as early as 1731.] The green outer flesh turns pale orange in the center. Large (4-9 lb.) 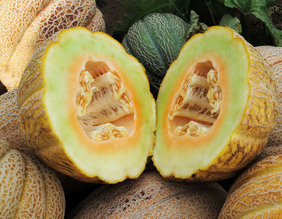 oval, slightly ridged, coarsely netted melons. The skin turns golden yellow when ripe. Very productive. Pkt.